Jimdo was a small start-up that has become internationally known for providing customers an easy to use website design builder. It has a simple and clear interface which allows the customer to build a professional and attractive website without requiring fancy templates, and premium content. From the individual, to the small business, building an impressive web presence with Jimdo is easy with the selection in comprehensive tools that are rarely offered anywhere else. There are more than 120 different templates to choose from, that although may not be fancy in design, will come together to create a professional high quality website. Some templates allow you to add in a full background bootstrap slider or video of your choose, thus allowing you to add visuals to the backdrop of your website. All of the templates do have access to HTML flexibility so if you have coding experience, you can add in HTML or CSS based language, thus creating custom designs for your website. Jimdo Free: Has everything you need to get started with built in SEO tools, one sub-domain under the Jimdo name, as well as blogging functions and an RSS feed. 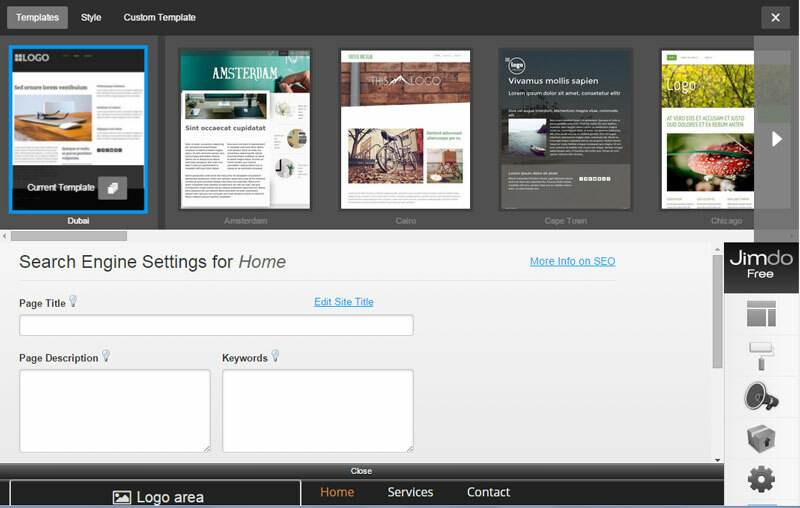 With over 120 templates to choose from, each come with a wide variety of widgets to add onto your website layout to make it unique. Jimdo Pro ($90/yr): Has quite a lot more to offer than the free version, with pro templates, popular widget choices as well as access to one custom domain not under the Jimdo name. You get one e-mail account, e-mail confirmations, access to the e-commerce platform and the ordering process system that comes with it. You also have access to Jimdo's invoicing system, statistics about your website and be ad-free. Jimdo Business ($240/yr): This package has pretty much absolutely every feature that Jimdo offers, from two custom domains, to a business e-mail package, to priority support. In addition to getting more in depth statistics, your website will also be ad-free and mobile optimized. The e-commerce platform will allow you to have unlimited listings for your products, have no transactions fees and you will even be able to create discount codes. Overall the website does an amazing job at packaging highly customizable options into affordable packaging that any individual or business owner may want. With a great mobile experience, a robust e-commerce platform, and blogging function, the website builder has all of the regular features. The only thing that seems to be missing is that for those who want multiple contributors to their blog or web-store, can't. There is no function to add more than one contributor to the website.